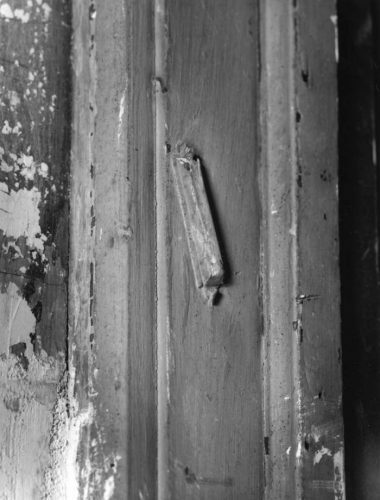 In the Maxwell Street neighborhood, vestiges of its Jewish past remain evident, pre-demolition, such as this Jewish mezuzah posted on an interior apartment door at 1210 S. Union. Mutiple layers of paint attest to its passage of time when the building served as a poultry shop with a synagoue and rabbi’s residence occupying the top two floors. All images published by the Maxwell Street Foundation within this website are copyright of the artist and are for educational, personal, and/or noncommercial use only. For any other use, please contact gro.n1555619466oitad1555619466nuoft1555619466eerts1555619466llewx1555619466am@of1555619466ni1555619466.